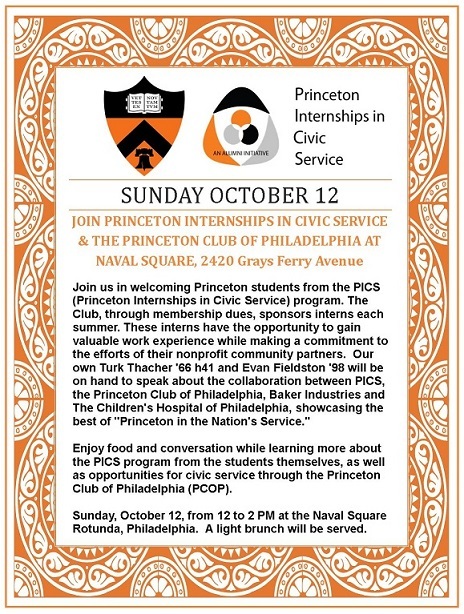 Join the Princeton Club of Philadelphia in welcoming Princeton students from the PICS (Princeton Internships in Civic Service) program. The Club, through membership dues, sponsors interns each summer. These interns have the opportunity to gain valuable work experience while making a commitment to the efforts of their nonprofit community partners. Our own Turk Thacher'66 h41 and Evan Fieldston'98 will be on hand to speak about the collaboration between PICS, the Princeton Club of Philadelphia, Baker Industries and The Children's Hospital of Philadelphia, showcasing the best of "Princeton in the Nation's Service." Enjoy food and conversation while learning more about opportunities for civic service through the Princeton Club of Philadelphia (PCOP). Sunday, October 12, from 12-2:00pm at the Naval Square Rotunda, Philadelphia. A light brunch will be served. Naval Square is located at 2420 Grays Ferry Avenue. The Rotunda is located inside Biddle Hall, the historic central building at Naval Square. There is no charge for this event, but RSVPs are strongly encourages so that we can plan accordingly.